"This recipe will produce the biggest biscuits in the history of the world! Serve these gems with butter, preserves, honey, gravy or they can also be used as dinner rolls...you get the picture. The dough can also be prepared several hours, and up to a day ahead of time. If so, turn dough out onto aluminum foil that has been either floured, lightly buttered or lightly sprayed with cooking spray. Roll up foil until it is sealed, and refrigerate. 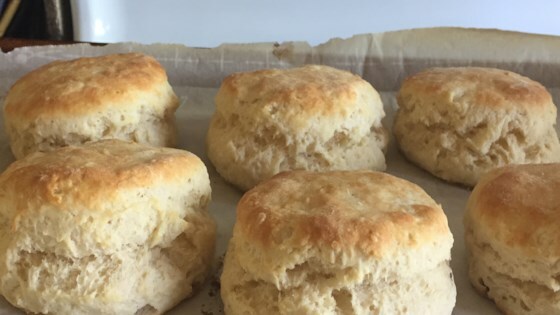 Don't be surprised if your biscuits rise even higher because the baking powder has had more time to act in the dough. You may have to make a few batches before you get desired results: desired results equals huge mongo biscuits." These biscuits tasted OK, but they were very dense and doughy. (Is that a word?) The search for a great biscuit recipe continues. Excellent recipe ! Being a single guy -no shortening or milk in the fridge, I used butter and a cup of beer. Go ahead and laugh, but they came out great. Mandy14 - The instructions say to knead 14-14 TIMES, NOT 14-15 minutes! The object is to handle the dough as little as possible.